Darin Strauss | Pen Parentis Literary Salons | Parenting Done. Write. Born on Long Island, I currently live in Brooklyn. I am also a parent. I don’t have an author website, but the Darin Strauss wikipedia page is pretty current. 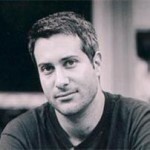 Darin Strauss is the best-selling author of the New York Times’ Notable novels The Real McCoy and More Than It Hurts You and the Los Angeles Times Book of the Year Chang & Eng and his critically acclaimed memoir, Half a Life. Strauss has seen his work translated into fourteen languages, and published in over 20 countries; he has received numerous awards, most recently a Guggenheim Fellowship in Fiction Writing. Also a screenwriter — he has worked with Disney films, Julie Taymor, and, on the screen adaptation of Chang & Eng, Gary Oldman — Darin has written fiction, essays, and criticism for the New York Times, GQ, Esquire, One Story, McSweeney’s, The Washington Post, Salon, and many others. He has read at the Pen Parentis Literary Salons twice and counting, and sits on the Pen Parentis Advisory Board. He lives in Brooklyn with his wife, the journalist Susannah Meadows, who writes a monthly Newly Released Books column for The New York Times’ daily Arts Section. They have identical twin boys, whose names are not Chang & Eng. Chang & Eng was a Los Angeles Times Best Book of the Year, a Newsweek Best Book of the Year, won an ALA Alex Award, and was a runner-up for the Barnes & Noble Discover Award, the Literary Lions Award, a Borders Award winner, and a nominee for the PEN Hemingway award among others. The rights to the novel were optioned to Disney, for the directorJulie Taymor; the actor Gary Oldman purchased the rights from Disney. Strauss and Oldman are together adapting Chang and Eng for the screen. The Real McCoy (2002), was named a New York Times Notable Book,” and one of the “25 Best Books of the Year,” by the New York Public Library. It was after this novel that Strauss won a Guggenheim Fellowship in Fiction Writing. More Than It Hurts You (2008) made a number of year-end best-book lists, and was also a national bestseller—reaching as high as #3 on both the Denver Post and Rocky Mountain News lists, and #6 on the New York Post list, in July, 2008. Half a Life won the 2011 National Book Critics Circle Award (Autobiography).